Rose geranium, european lavender, palmarosa and ylang ylang essential oils with shea, macadamia and avocado oils to moisturise, restore and regenerate. Hand-made by Cinnabar Green without any testing on animals. Macadamia, Avocado oil and Shea butter for ultimate moisturising with a fragrantly therapeutic combination of essential oils. Geranium is anti-inflammatory, helps to heal broken capillaries and relieve eczema; palmarosa aids cellular regeneration, and lavender has wonderful healing properties. Ylang ylang is being studied for it’s skin cancer fighting properties. 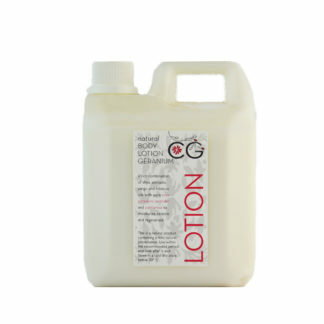 Massage a generous amount of lotion into your skin morning and night. In particular after your shower. This is a natural product containing a mild natural preservative. 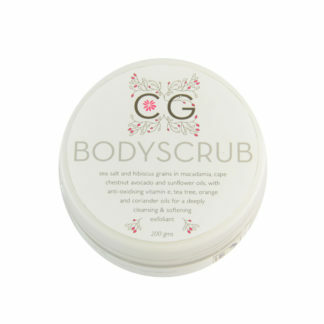 This is a natural product containing cold pressed oils and is jam packed full of their therapeutic powers. Look after it carefully. Vegan friendly. Use within the recommended period (18 months) and look after it well. Store in a cool place, below 30°C. Aqua, Persea gratissima, Emulsifying wax nf, Butyrospermum parkii, Helianthus annuus, Glycerin, Macadamia alternifolia, Phenoxyethanol, Pelargonium graveolens, Lavandula angustifolia, Cananga odorata, Cymbopogon martinii, Carbomer.